This is a list of pre-release and unused content for the game Super Paper Mario. This game was originally announced for release on the Nintendo GameCube, and was at one point considered for release on both the GameCube and the Wii (as with The Legend of Zelda: Twilight Princess). By summer of 2006, Super Paper Mario was a Wii exclusive. Previews of the GameCube build appear to show that all characters' special abilities would be activated with the button rather than the different buttons they had on the final Wii version. Most Pixls (initially named "Fairens") would be activated with the Button, and all Pixls but Tippi seemed to be one Pixl who would morph into others to use "Fairy Abilities" (such as Fairy Toss, Thoreau's predecessor, and Fairy Hammer, Cudge's predecessor). It is unknown what button would activate Tippi in the GameCube version. The "action" icons when near an object or character looked more similar to the ones of the first two, but they were modified when the game was moved to the Wii. Princess Peach and a cut "ladder" Pixl fighting Big Blooper. An early version of the game had a different darker looking version of the Whoa Zone from Chapter 4, and Mario is still wearing a helmet, when he wasn't supposed to be. Also, an early screenshot shows Mario under the effects of the Mega Star, but is colored very differently (giving his current colors rather than the initial ones seen in Super Mario Bros.). Oddly, he is shown in his proper colors in the official trailer that was released at the same time, which may imply that the screenshot's release was simply delayed. In a screenshot featuring Big Blooper, there's an odd Pixl that is shaped like a ladder. It never actually appears in the final game. This Pixl would have been used to flip Mario to 3D, as revealed by unused Pixl data within the game's files that contains identical scripting to Mario's flip ability in the final game. Also, in the same screenshot, Tippi is present, but she was kidnapped by Francis at this point in the game, and by the time she is rescued, Big Blooper cannot be fought again. Finally, the scene depicting Bowser and Peach's wedding at the beginning of the game was also slightly different in pre-release versions; the ceremony would appear to have once taken place in more of a room than an open area, there were no flowers decorating the columns, the rising of the Chaos Heart was surprisingly light, and Count Bleck raised his cloak up earlier than he did in the final version. Plus, in the screenshot, Peach is standing instead of having been knocked over, and Bowser looks normal rather than shocked. An earlier version of Whoa Zone from the E3 2006 trailer. An early depiction of Bowser and Peach's wedding. An early version of Princess Peach in Yold Town. There are some unused items still stored in the game. Most of them are labeled as "Unavailable Item", and don't do anything. Additionally, graphics exist for several items that do not appear in the game. Notably, the pink Cooking Disk is functional and referred to in-game as "Cooking Disk PI" ("Cooking Disk 1" in the PAL versions), though it doesn't add any pages to the Dining Specializer. Most likely, the first recipe page was going to be obtained via a Cooking Disk instead of being built-in from the start. This also explains why the purple Cooking Disk is called "Cooking Disk PU" instead of simply "Cooking Disk P". Another unused key with a similar design. The game's data include graphics for enemies that do not appear in the game and different designs for enemies featured in the final game. A Wiggler. This would be their debut in the Paper Mario series. They later appeared in Paper Mario: Sticker Star. Note that it has black shoes rather than the usual red. The game also contained unused data for Mario's partners from Paper Mario and Paper Mario: The Thousand-Year Door, except for Sushie. All of the partners including Sushie make cameos as Catch Cards in the final version. There are some unused animations, including a side view of Mario climbing a ladder, and Dimentio walking. Mario climbing a sideways ladder, which is impossible in the final game. Dimentio's walk/run animation, which is never used in the final game. There are a number of unused maps and rooms in the game. These include a room in the Whoa Zone featuring a chest containing Piccolo's card, an unused room in the final area of Castle Bleck, and a room in Floro Caverns with a Save Block and some enemies. Some used maps have unused collision data and textures in the third dimension. If the player manages to spawn in one of these maps, they can be played normally. These include the Mario Bros.' House, Bowser's Castle and the chapel in which parts of the prologue and ending take place. 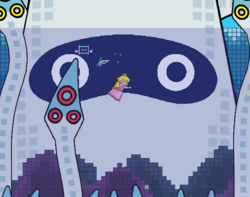 For unknown reasons, the Korean version of Super Paper Mario contains 11 unused maps not found in the other versions, some of which includes unique humanoid cat creatures that are part of the stage geometry and cannot be interacted with. These do not fit the style of the rest of the game, though they somewhat resemble the style of the first Paper Mario. Artwork of a Gold Fuzzy. The Gold Fuzzy might have been present in early builds of the game, as their artwork used for Paper Mario: The Thousand-Year Door is featured on the back cover of the official Nintendo Power guide and the Prima strategy guide. Original title screen with the mysterious ladder Pixl. Another image of the cut Pixl. ↑ As stated in Nintendo Power Issue 206. ↑ GameIntus (December 18, 2018). Super Paper Mario's Biggest Secret EXPOSED! - GameIntus (feat. MayroSMM). YouTube. Retrieved December 21, 2018. This page was last edited on March 29, 2019, at 08:49.